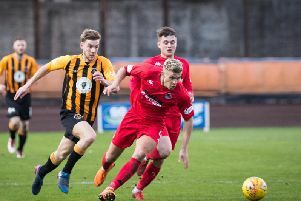 Berwick gave themselves some breathing space at the foot of the table when they beat Montrose in their basement clash at Links Park. The teams went into the match occupying the bottom two places in the league, separated by five points, and both were desperate for a win to ease their wooden spoon fears. Rangers had not beaten Montrose in three meetings already this season and with only one win in their last eight games they were not in the best of form. But goals by Lee Currie and Blair Henderson, which came within a minute of each other, gave Rangers a welcome victory, which lifted them one place up the table to eighth. Berwick went into the game with major selection worries. Goalkeeper Billy Bald, Darren Lavery, Ross Drummond and Colin Cameron, were all injured, which meant Michael Andrews, Scott Maxwell and Henderson were all handed starts with Kyle Wilkie making his debut in midfield. Wilkie is a former Hamilton, Morton and Livingston player, who mist recently has been playing with Nairn County. Paul Harkins pulled a shot wide after just five minutes for Montrose, and two minutes later a Paul Willis shot was saved by home keeper Stuart McKenzie. Berwick had their fair share of possession in the early stages and Maxwell shot narrowly over after quarter of an hour, with Willis pulling a shot wide just a minute later. Jonny Fairbairn also headed over from a corner, but Montrose also had their moments and Paul Watson shot over from outside the box. McKenzie did well to save from Willis in the top corner and he also denied Lee Currie from outside the box with a high collect under his crossbar. As Berwick tried to turn the screw Wilkie and Fairbairn also both had efforts saved by McKenzie in quick succession and a few minutes later he dived low to prevent Devon Jacobs from finding the net. Just before half-time Wilkie and Henderson both shot over, but for all their efforts Rangers were unable to find a breakthrough and at half-time it remained 0-0. Into the second half and Willis was again denied by McKenzie, whilst at the other end Marvin Andrews headed over from a corner. After an hour Henderson shot wide for Berwick and it was McKenzie again who saved from Currie as Rangers threatened. But the game turned after 74 minutes when Terry Masson was shown a straight red card for a foul and Currie netted from the resultant free kick, beating McKenzie in the bottom corner. And just a minute later Rangers doubled their advantage when Henderson found the net from inside the box after Wilkie made the opening. Montrose: McKenzie, Masson, Andrews, Crawford, Steeves, Webster (Allan 78), Cameron, Watson, Harkins (Banjo 59), Wood, Johnstone (Johnston 86). Berwick: Andrews, Jacobs, Young, Fairbairn, Maxwell, Notman, Willis, Currie (Gray 85), Wilkie (Gold 79), Russell (Miller 84), Henderson.